Galveston residents weigh in on hurricane levee proposal that some call "a really bad, bad plan"
The U.S. Army Corps of Engineers and the Texas General Land Office proposed a massive levee system for the Houston area in late October that would cost as much as $20 billion. It's part of a larger plan to protect the state's coastline from hurricane storm surge. GALVESTON — Lauri and Scott Mathias were preparing to break ground on their retirement home just blocks away from the beach when they heard the news: The government had proposed building a massive levee a few blocks behind their property. That would leave their future home on the coastal side of the structure — and unprotected during hurricanes. The couple bought land on the sparsely populated Bolivar Peninsula two years ago after they became smitten with the close-knit community. They hoped to build a house there by next summer. Now, they’ve put things on hold while they figure out what exactly the levee plan entails. 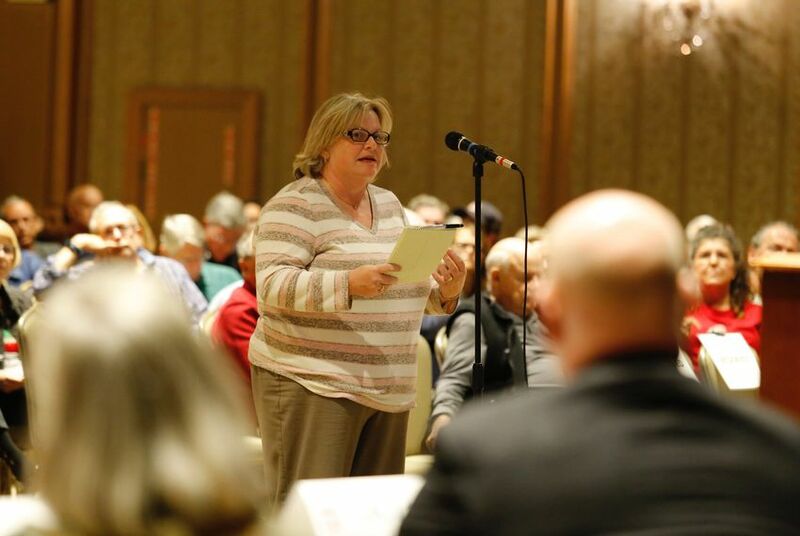 The couple was among a few hundred people — residents, business owners, members of conservation and environmental groups, local and state elected officials — who showed up Wednesday night at the convention center on this perpetually storm-battered barrier island to weigh in on a multi-billion-dollar government proposal to build a so-called "coastal barrier system." The U.S. Army Corps of Engineers and Texas General Land Office want to construct a sweeping complex of levees, flood walls, gates and pump stations along dozens of miles of Texas coastline. The overwhelming sentiment was that the barrier system — intended to protect the low-lying Houston-Galveston region and the nation’s largest petrochemical complex from deadly hurricane storm surge — was a miss. But the level of concern varied. Some, especially Bolivar residents, said they didn’t want anything to be built at all. Some said they accepted the risk when they chose to live there and didn’t need the government to bail them out. Others said they liked the general concept and that some form of protection is needed, but that the placement was all wrong. Mayes Middleton, a Galveston Republican elected to the Texas House last month, garnered applause with his vocal criticism of the proposal, which was unveiled in late October. “This is a really bad, bad plan right now,” he told a row of Army Corps and Land Office officials seated at the front of a large convention ballroom. 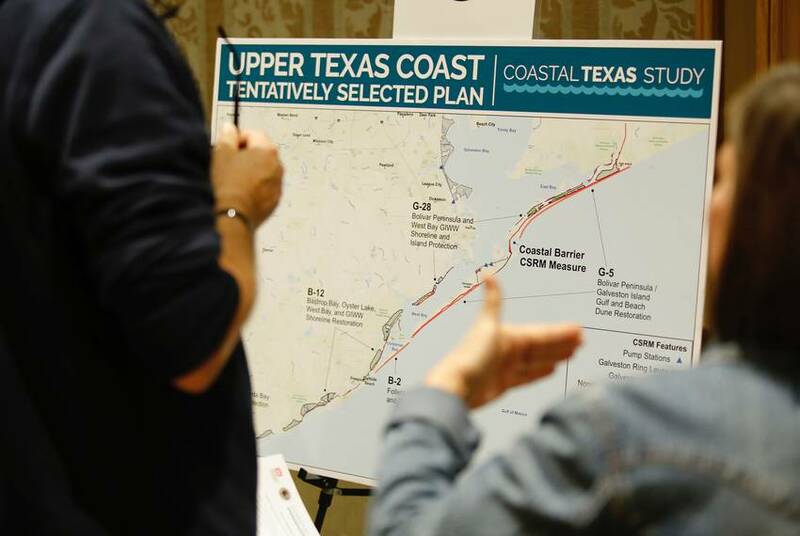 The barrier system is part of a larger plan that is estimated to cost as much as $32 billion and will include the restoration of dunes and marshes on the lower Texas coast. Agencies estimate the barrier system alone will cost as much as $20 billion — a price tag many balked at Wednesday night, noting it didn’t even account for maintenance. Yet the plan has been years in the making. Ever since Hurricane Ike nearly hit Houston head on in 2008, storm researchers have actively urged elected officials to build some kind of coastal barrier to protect life, property, the environment — and a quarter of the nation’s petroleum refining capacity. If Ike, the costliest storm in the state’s history at the time, had hit just a little farther down the coast, sophisticated storm models show it would’ve sent an even more devastating swell of water into the heavily populated and industrialized Galveston Bay area. It also would have inundated the Houston Ship Channel — one of the world’s busiest shipping lanes. The surge could’ve dislodged thousands of crude and chemical storage tanks in the area, resulting in a devastating environmental disaster. Gas prices, which spiked significantly as it was, could’ve blown through the roof across the country. Researchers at Texas A&M University at Galveston and Rice University put forth other proposals years ago, as has a quasi-governmental agency called the Gulf Coast Community Protection and Recovery District. One concept that emerged as a favorite and won support from high-ranking elected officials calls for installing some kind of levee or seawall along Galveston and Bolivar, and placing a gate between the two landmasses that could be shut ahead of storms. That concept first emerged in a plan out of A&M Galveston that was dubbed "the Ike Dike." A later plan was named "the coastal spine." But Army Corps officials attempted to distance the agency from those ideas Wednesday night and stressed that their proposed placement was highly tentative. “What you’re learning about tonight is not the Ike Dike, it’s not the coastal spine,” said Kelly Burks-Copes, a project manager at the Army Corps' Galveston District. Stationed in front of informational poster boards, Burks-Copes and other government officials repeatedly described the placement of the levees as “conceptual” and subject to change. That didn’t do much to appease the Mathiases who told Burks-Copes they feared their future home would turn into a “washing machine” when a storm hit the proposed barrier behind their home and retreated back toward the coast. Burks-Copes told them that if the final plan endangers properties in any way, the Army Corps would be required to mitigate the impacts by paying for property owners to raise their homes or to buy them out. Many residents interviewed Wednesday said they feared the impact to their property values — and their ocean views. Lauri Mathias said she had already seen more homes for sale on Bolivar, which she attributed to panic over the levee plan. The plan “could change dramatically” based on public input and further study, Burks-Copes said in an interview, noting that now is the time to weigh in. The deadline to submit comments on the plan is Jan. 9. But of the four plans the Army Corps considered recommending, Burks-Copes said this one had the best cost-benefit — a key component of the agency’s methodical study process. Much of the concern expressed Wednesday appeared to be generated by the many lingering unknowns — where exactly the levees would go, for example, and what they would look like. They could be a mix of sand-covered dunes and berms that may be topped with parks and jogging trails, or they could be vertical concrete seawalls that would inevitably block ocean views, Burks-Copes said. In a summary of its written comments on the plan sent out Tuesday, a coalition of more than a dozen environmental and conservation groups complained that the accompanying environmental impact assessment “is insufficient to enable thorough and informed comments.” They also cast doubt on the accuracy of the agencies’ ecosystem modeling and said they didn't thoroughly describe impacts to commercial and recreational fisheries and wildlife habitat. Such specifics will be figured out later, when the Army Corps moves on to the next phase of the largest study it’s ever undertaken in its more than 200-year history. “There are a lot of details that still need to be worked out,” said Col. Lars N. Zetterstrom, the head of the Army Corps' Galveston office, in his opening remarks. It will take at least until 2021 to settle on a plan; after that, its fate will be in the hands of Congress, which is under no obligation to fund it.